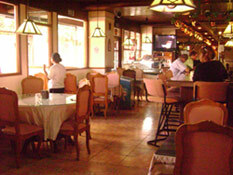 The Costa Inn restaurant has a reknown menú in the Spanish and Panamanian cuisine. Panama is fortunate as far as cuisine goes and we recommend with great confidence the corvina or sea bass in any of its modalities. Our specialty fish dish is the vasque style corvina or grilled corvina. On the other hand, Panama is a producer of great beef, which you should definitely taste at our Costa Inn restaurant. At our restaurant you should try the Filet Mignon. If you are looking to try some domestic seafood, try our exquisite lobster. And taking a cue from our Spanish menu, we invite you to enjoy the taste of Octupus a Feira. During your visit to Panama take the opportunity to refresh yourself with our abundance of tropical fruits, such as: pineapple, papaya, orange, watermelon and melon. We offer breakfast, lunch and dinner at our restaurant. Please contact our Sales Representative to assemble the package that best suits your needs. The Internacional Airport of Tocumen is only 20 minutes from the Costa Inn Hotel taking the South Expressway. Additionally, Costa Inn Hotel guarantees that if you choose a package that includes room, food, and transportation you will get the best rate in the market, making your transportation to the hotel even cheaper. The Costa Inn Hotel has a large covered parking area for our guests with direct access to the reception area. 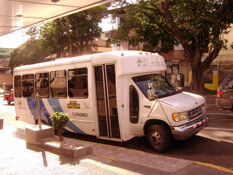 It has the capacity for small cars, as well as for buses with 12 to 50 passengers seats. The cost for parking is included in the room rate so you do not have to worry about where you leave your car or how much it will cost. For your safety, the parking area is a restricted area for hotel guests only. 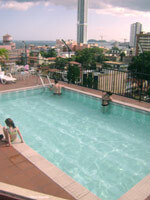 On the seventh floor, in an open area, you will find the swimming pool and terrace, with an excellent view of Panama Bay. We have restaurant service at the pool which allows you to enjoy the sun and water while you enjoy a refreshing fruit juice or soda. Our hotel has four conference rooms available which can be combined to provide space to accommodate between 10 and 100 persons comfortably. We can also supply required equipment for your use, such as: overhead projectors, television sets, video machines and microphones. We can plan your event custom tailored to your needs. 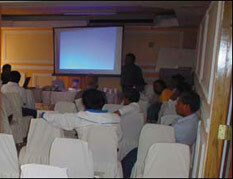 Your Costa Inn Hotel is the ideal place to host your company seminars, training sessions for new employees, press conferences, work meetings and other similar activities. Design by: Sistemas TL, S.A.